A useful diagram of hand anatomy that provide the names of each parts of your hand. This chart is useful when you describe your condition to healthcare professionals. the largest, shortest and most important of the digits of the hand. second finger of the hand, next to the thumb. second finger from the outside of the hand. smallest and last finger closest to the outside of the hand. bone at the end of a finger. small, middle bone of a finger. small bone of a finger, closest to the palm of the hand. jointed segment of a finger. joint between the first and second phalanges. 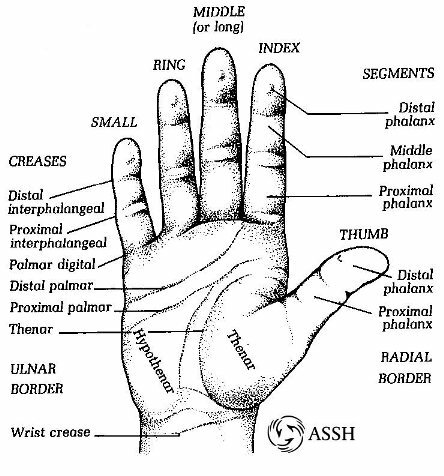 joint between the second and third phalanges. the Ulna is one of the two long bones in the forearm, prismatic in form. In anatomical position the ulna is placed at the medial side of the forearm closest to the body, parallel with the radius on both arms.